This time last year MSI launched its first PC gaming monitors, dubbed the MSI Optix Series. The gamer styled monitors sported appropriate specs offering high refresh rates and adaptive sync technology with specialised gaming features such as optimised colour curves and reticule overlays. Furthermore, they offered excellent colour reproduction with wide viewing angles, and quantum dot enhanced gamut. Now MSI has written to HEXUS to highlight its new Optix MAG Series. If you head on over to the official MSI website you will find the new Optix MAG monitors already listed. We are informed that the new lineup consists of the MSI Optix MAG24C, the MSI Optix MAG27C, and the MSI Optix MAG27CQ. That last one is the 27-inch QHD monitor. 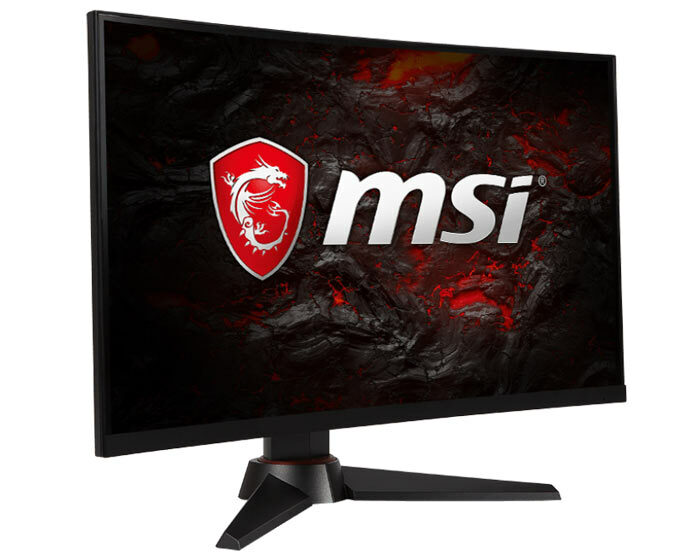 Feeding them into MSI's onsite comparison engine you will notice that these monitors have a lot in common. First of all they all use 1800R curved VA panels (from Samsung I think), they offer a max refresh rate of 144Hz (plus Adaptive Sync tech), a response time of 1ms, max brightness of 250 nits, wide viewing angle of 178 degrees, contrast ratio of 3000:1, and NTSC / sRGB gamut of 85 per cent / 110 per cent. In more general qualities they all feature power consumption of 48W, have 1x DP, 1x HDMI, and 1x DVI connectors, plus MSI profile settings for warm, cool, eye saver, PC, movie, FPS, RTS, and a User mode. All the monitors can be swivelled, tilted and height adjusted. MSI tells HEXUS that the new range of Optix MAG Series curved gaming monitors will become available globally sometime this month. I've had a quick look around and seen the Optix MAG24C, Optix MAG27C and Optix MAG27CQ listed for pre-order in Europe at approx €290, €390, and €440 respectively. Max brightness is a little low otherwise on paper at least they look interesting. If the 27“ QHD monitor was made available for £399 in the UK I might be tempted. I'm been considering a curved 27” QHD 120/144 Freesync monitor for a few months…Samsun CF791 is still top of my list though. I've just bought the Samsung 24" version of these, and I have the brightness set between 20-40%. I can't imagine a situation of needing it brighter, unless there are spotlights directly behind me when I'm using it.